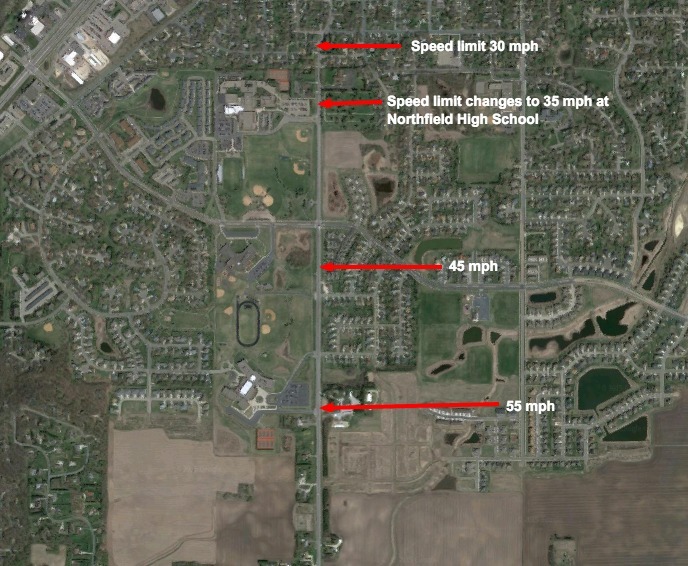 246 Solutions Group is a new grassroots “group of concerned Northfield residents that came together to help change a very dangerous intersection” on MN State Highway 246 near three of Northfield’s five schools by asking MnDOT to reduce speed limits on 246, creating a school zone, and improving the intersection at 246 and Jefferson Parkway. 246 Solutions has also drafted a petition (with about 200 signatures to date) to MnDOT Commissioner Charlie Zelle and other MnDOT officials asking MnDOT to reduce the speed limit, establish a school zone and “follow the Safe Route to Schools Recommendations of the sections of State Highways That Become City Streets.” And here’s a behind the handlebars video view of biking to school by high school student Jake Thomas. Various impediments to change have been raised in response to the petition such as insufficient resources for enforcement, cost to build improvements, etc., but this infusion of new energy is needed to help spur action on this old problem. The problem of reaching Northfield’s schools safely has existed since before the Middle School opened its doors more than ten years ago and while there has been much discussion and planning, there’s been no action. However, other parts of the transportation landscape have changed in the meantime and tools exist now which were not well-known at earlier points in the discussion; this new grassroots push could finally move Northfield to action. By locating the Middle School south of Bridgewater Elementary School and the High School…All of our public school children grade 6 and above + our largest elementary school will now attend school in the same area. 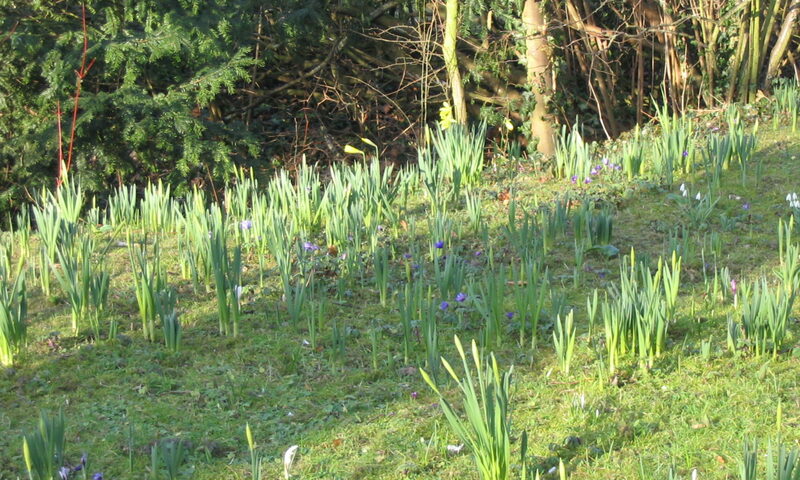 This is a great opportunity to develop these sites into an excellent educational and athletic campus not possible with more disparate and smaller sites. But this also means we have the safety of hundreds of our children to consider as we try to also manage the vastly increased [vehicle] traffic through the area…the traffic patterns on Jefferson Parkway, through Bridgewater and high school campuses and on 246 are problematic now, before any additional load is added to the area. The traffic impact study for the Middle School focused on the impact to vehicle Level of Service during the peak traffic at the start and end of the school day and made recommendations to (1) stagger school opening times to alleviate congestion (which was done) and (2) add the median to Jefferson Parkway to “provide more direction for drivers, which will in turn make it a safer corridor” and provide a pedestrian refuge, but which made the roadway too narrow to bike safely and difficult for school buses to turn. It is truly sad that it often seems to take a tragedy of some magnitude to get people’s attention about pedestrian and bicycle safety, and make them realize that streets aren’t just for cars and trucks. Additional challenges relate to the lack of interconnected neighborhoods in some parts of the City. This is particularly evident in the area south of Jefferson Parkway. The extensive amount of cul-de sacs results in an overreliance on Jefferson Parkway and TH 246/Division Street for all trips in the area. 2009 Safe Routes to School plan highlighted this area and proposed a range of solutions for the Jefferson/TH 246 intersection from a traffic signal to a roundabout. 2012 Complete Streets policy was adopted. 2014 Bike Friendly Community application (we received an Honorable Mention). 2014: TAP Grant Application in 2014 for a traffic signal at Jefferson Parkway and TH 246 was withdrawn after discussion that a signal was likely not the best solution. Now’s the time to take all the plans and policies plus the new grassroots support and do something. In the short-term, the 246 Solutions group plan to establish a school zone and slow traffic should be implemented, but the longer term fix should be multi-jurisdictional and address land uses, design speed, and lack of other connections – this problem is not MnDOT’s alone. 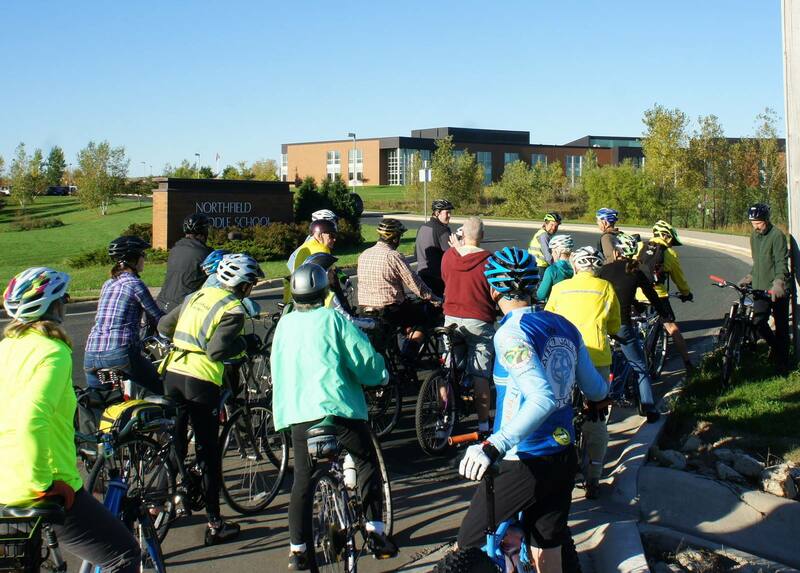 The 246 Solutions community support is to demand committed and sustained leadership from the school district, city and MnDOT to make Safe Routes to (the majority of Northfield’s) Schools a reality. Fortunately, much has changed since 2001 in the land use and transportation world. In Northfield, we’ve added all those studies and policies to justify change toward building streets as if people mattered. National Safe Routes to School reports, other cities’ leadership, and federal programs (Mayor’s Challenge, Surgeon General’s Step It Up campaign) all signal a shift in the political landscape which recognizes how we build our cities matters. What used to be a safety issue alone is now a public health, livability, fiscal, urban planning and environmental issue. Reducing vehicle traffic by encouraging bus ridership as well as actively promoting biking and walking. Years of development choices, fewer parents at home, and helicopter parenting have contributed to the steep decline in walking and biking to school. Usually not mentioned is that much of the traffic to the schools is generated by parents chauffeuring their children to school (When my daughter was a middle school student, I joked about adding a toll booth to the Middle School driveway to raise funds for improvements and to allocate the costs of driving more equitably). A recent MinnPost piece highlighted how change is happening in Minneapolis to encourage active transportation. Slowing traffic: Speed limit signs, even the speed feedback signs, must be enforced to be effective. TH 246 screams “Drive fast!” and it needs to be redesigned to cue drivers to slow down, look for people walking and biking, and (most importantly) pay attention. Redesign the Jefferson Parkway/246 intersection for people rather than cars only. 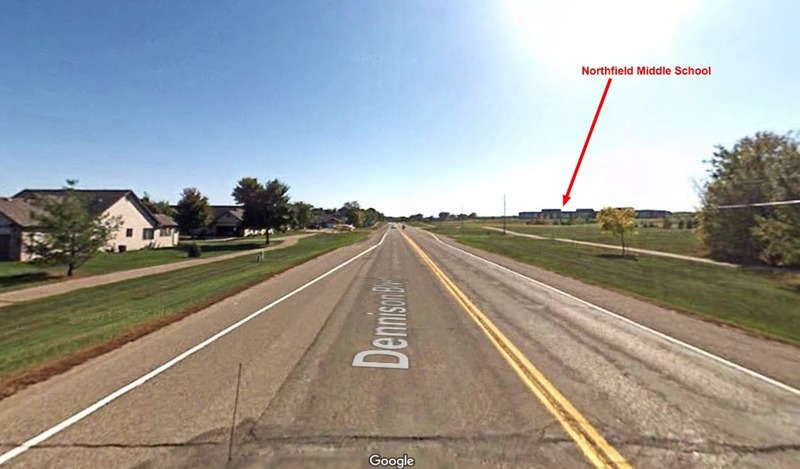 The intersection must accommodate school buses, cars, and larger vehicles because 246 is a key route into and out of Northfield, but the trail connections, sidewalks, bike facilities must also be safe and easy for kids (and seniors – the Senior Center is there, too) to navigate. Create at-grade connections from neighborhoods to schools (and the Senior Center): Bridges and underpasses are usually put forward as solutions, but I’d advocate for changing the roadway design to build people back into the street network and make the public right-of-way truly public (as well as safe and attractive). Newer design guidelines (like Seattle’s Safe Routes to School Engineering Toolkit or NACTO standards) can provide guidance. Politics and money: The Northfield City Council will vote on next year’s tax levy very soon. Some Council members want to avoid any levy increases because fund balances are flush, but clearly there are needs which have gone unmet for a decade. Voting for a small levy increase would help take advantage of Northfield’s favorable financial position to start to fix this important area at last.